Good morning! This is us. We’ve been up for quite a while (since 4:45 am) – so about 4 ½ hours. Right now, we’re taking a mental break, BUT doing what we’d intended to do. Our Internet is frozen, so we’re not getting music OR our Evernote. We’d intended sending Dr. Marvin a copy of our page. For the start, here, we’ve been working on “Our Life Plan.” We’ll talk about that in a small while. Ok, it's a bit later. Actually it is an hour later. We are back to our blogging. But have only done one slim paragraph. 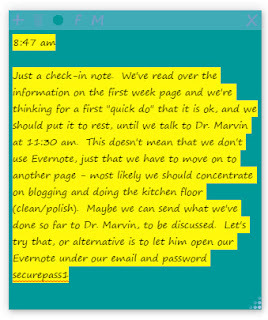 We have read over the last evernote note that had also gone out to Dr. Marvin. We are up to reading his version. We haven't been able to put away the copy of the note ... we need it to hold our place. If it went away, so might our present efforts. We are here. So according to this, we're doing good. The blog entry has started and we've started on the floors. Yesterday, we swept the floor and just now we finished in two segments washing the floor with the Shark machine. We've still got to wash the office area and the area in the living room, and then of course buff all four areas. I'm thinking that we might have to mop it too, maybe between the wash and the buffing. We need to pick up the pieces that weren't picked up in the first sweeping and to get in the corners. I think the mop would work better and should be quicker. AND THEN, the buffing which is actually faster than the washing, but is in there. We're trying not to make this all such a big deal that it can't be done. We've waited for a long while to get to the floors with all the construction. We'll have to check back to the other entries, but as of today, we are only supposed to have about an hour and a half of Jeff work. That is what he said. He is supposed to come by today around 2 pm, if he gets the tile work - 2 slim pieces he has to insert, along with putting in the last 3 outlet covers. Better check to see if he's written a text message changing anything. Ok, Good no message sent, which could mean he's either coming or not, but we don't have to worry about it at this moment. We will have to take a shower and get dressed after talking to Dr. Marvin. We should have done that anyway.